This PDF 1.7 document has been generated by Adobe InDesign CC 2017 (Windows) / Adobe PDF Library 15.0, and has been sent on pdf-archive.com on 26/04/2018 at 18:02, from IP address 216.20.x.x. The current document download page has been viewed 106 times. 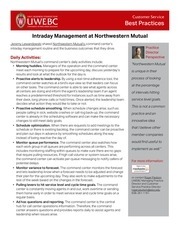 intraday management routine and the business outcomes that they drive. results and look at what the outlook for the day is. decides what action they would like to take or not. changes to still meet daily goals. instead of being reactive the day of. rest of the week based on the changes in the forecast. experience is consistent throughout the day for both employees and clients. maintaining a proper occupancy that keeps representatives busy without burning them out . sure there is a balance between processing cases and taking new calls in order to prevent status calls. continue to hit service goals. This file has been shared by a user of PDF Archive. Document ID: 00761480.